Dubai: Students as well as the alumni of the American University of Sharjah were taken on a trip to the peak of Mount Everest during an inspirational lecture by Suzanne Al Houby on Tuesday night. 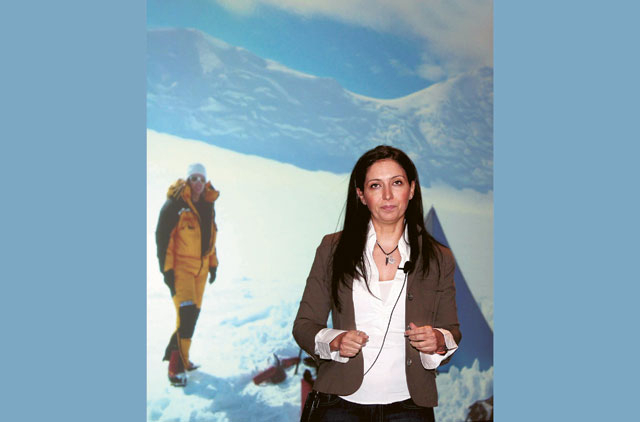 The first Arab woman to climb the world's highest mountain, Suzanne, 40, gave a step by step account of the gruelling expedition. Her journey inspired many participants at the lecture who hope to imbibe some of her determination. Al Anoud Ali, a 21-year-old student said, "We would never have this idea of accepting a woman climbing a mountain, it's a big accomplishment. My own Mount Everest, I want women to be empowered here in the UAE and I want them to have a right to practice anything a man can practice." "We're struggling in life and we need some hope. I am sure it wasn't as easy as we may think. I want to learn from her, I want to hear her experiences, what struggles and difficulties she faced," said Ahmad Abu Helwa, a 28-year-old engineer. "For me as an Arab woman it makes me feel it's okay, I can break the boundaries. I can have courage. She's a model for me to follow." Rasha Baddour, a 19-year-old student said. The deeply spiritual Suzanne explained what the audience yearned to understand, her motivation to accomplish this mighty feat. "Living my life day to day I felt this void and it was filled by this dream to climb Mt Everest. I pushed myself and I discovered strengths I didn't even know I had," she said. "During one of the intense moments on the mountain, a climber was asked by the Lama (Dalai Lama), who was giving us his blessings, why do you want to climb the mountain and he answered ‘just because it's there', which is a famous answer from previous expeditions. At that moment I felt goose bumps because as an Arab, we still don't have the luxury of doing something because it's there or because we feel like it. I had to deal with cultural, social, and religious barriers [to accomplish the feat]," Suzanne recounted. The Dubai-based mother of two climbed Mount Everest which towers at 8,848 metres above sea level on May 21. To put it in perspective, Burj Khalifa is a mere 828 metres in height and is the world's tallest man-made tower. Originally from Jaffa, Palestine, Suzanne trekked 51 days to scale Mount Everest as part of a four-member team, three of whom successfully reached the summit. Since the world's highest peak was first scaled by Sir Edmund Hillary and Tenzing Norgay in 1953, about 100 women from across the world have achieved this astonishing feat. "Becoming the first Arab woman to reach the top of the world was an enormous thrill and a great privilege," she said in an earlier interview. A lifelong mountaineer, Suzanne Al Houby is no stranger to the record books. In 2003, she became the first Arab woman to reach the Everest Base Camp. She is also the first Arab woman to scale Mount Elbrus, the highest point in Europe, and the first Palestinian woman to climb Mount Kilimanjaro, Africa's highest peak. To date, she has successfully reached the summit of the highest mountains on five of the world's seven continents.